Jamaica Race Course, in Queens, New York. The track was closed in 1959. 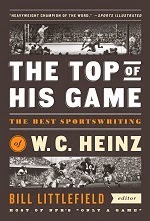 Free audio: This week’s selection is accompanied by a five-minute streaming audio version, read by Bill Littlefield, host of NPR’s Only a Game and the editor of The Library of America’s new collection of W. C. Heinz’s best sportswriting. If you don’t see the audio player below, you can listen to this selection at our SoundCloud page. They were going to the post for the sixth race at Jamaica, two-year-olds, some making their first starts, to go five and a half furlongs for a purse of $4,000. . . . If you don't see the full selection below, click here (PDF) or click here (Google Docs) to read it—free! Heinz’s postscript is copyright © 1982 W. C. Heinz and is reprinted above by permission of Gayl Heinz. Well, I like to read and I like to write. With that said, I definitely lack something to see the wonder in this story. Maybe it's in its simplicity, because that is what it is; simple, concise, yet it tells a story. However, on further reflection, I do see how this is an objective story. I guess it is the true mark of journalism. And to compose this within an hour, and the pressure to make the deadline, that is remarkable, too. Oh, and I've printed the story, so I have to read again and again.